There are days when I question if parenthood is worth it. Now don’t get me wrong, I love my son but we have entered the teen years and suddenly he is no longer my sweet little boy but a petulant and irritated teenager. He is driving me crazy. It is my lucky week since he is going away with his classroom for a few days to camp on the Oregon coast. That leaves some time for me and my husband to plan a quick getaway for a few days. When our lives are centered and structured around our children it can be hard to connect and make time for each other but we try to make an effort to have time for just the two of us. I might be a little absent from the blog for the next few days while I explore Seattle and disconnect from blogs and social media so I’ll leave you with a new favorite recipe to tide you over for a few days. I have always had a weakness for soda. I don’t drink alcohol or coffee but I have always had a habit of drinking diet soda. Lately I’ve been trying to curb my soda addiction by experimenting with some homemade versions. 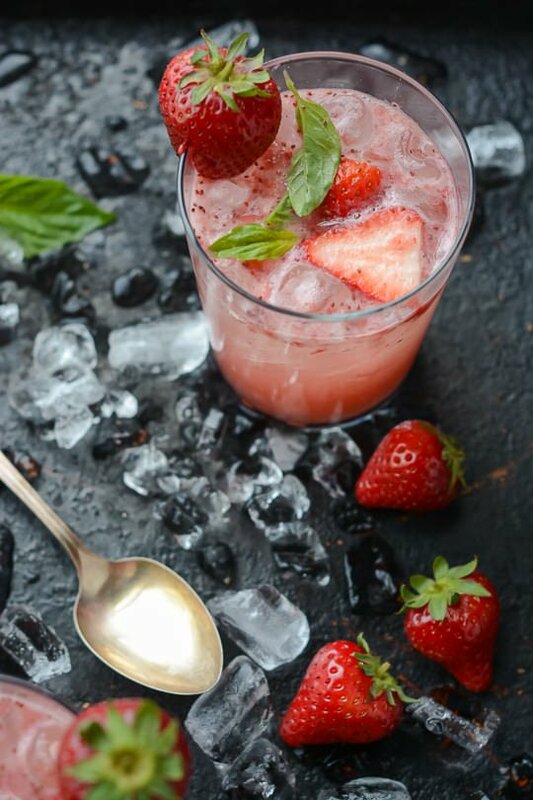 Strawberries are just starting to show up in the market and I love a little vinegar in my sodas so balsamic seemed the obvious choice. I decided to roast the strawberries to get a deeper flavor and I thought the balsamic would caramelize nicely and add a nice little tang to the syrup. I can see myself making this all through the summer as my strawberry patch starts producing! Making your own soda at home couldn't be easier. 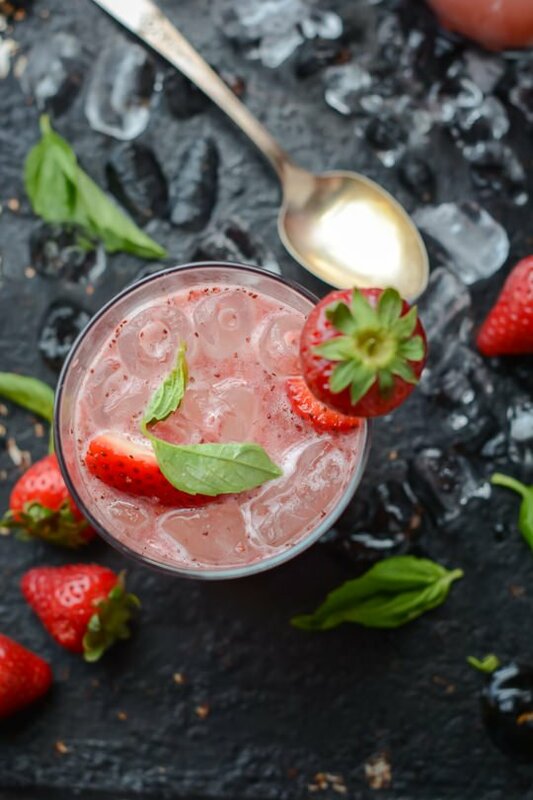 Roasted strawberries, balsamic and basil make a super refreshing drink that will keep you cool as the weather heats up! Pre-heat the oven to 400 degrees. 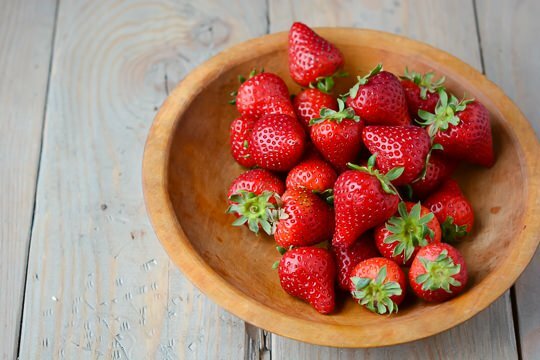 On a foil lined baking sheet combine the strawberries, balsamic vinegar, sugar and a pinch of salt. Roast the strawberries for 20 - 25 minutes until the berries are slightly sticky and caramelized. 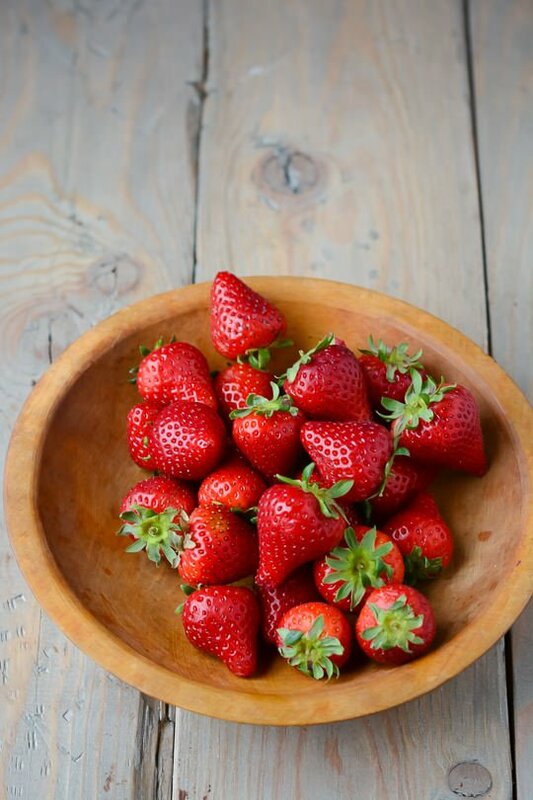 Puree the strawberries in a blender until smooth with a ½ cup water until smooth. Strain the mixture through a sieve, pushing the juice through with a spatula. Discard solids. In a small saucepan combine the ½ cup water, ½ cup of sugar and the basil and bring to a boil. Reduce the heat to a simmer and cook for 5 minutes, stirring occasionally. Let the syrup cool completely and then strain the syrup through a sieve into a clean container and discard the solids. 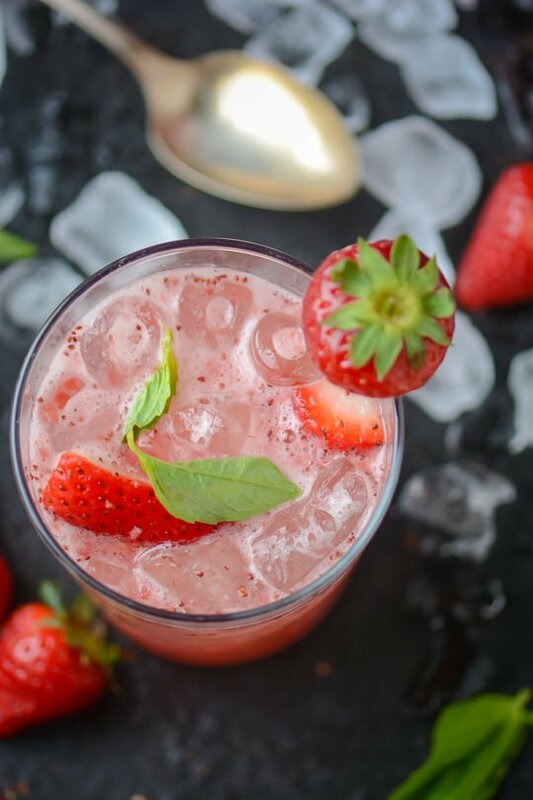 Add the strawberry puree to the basil simple syrup and stir to combine. 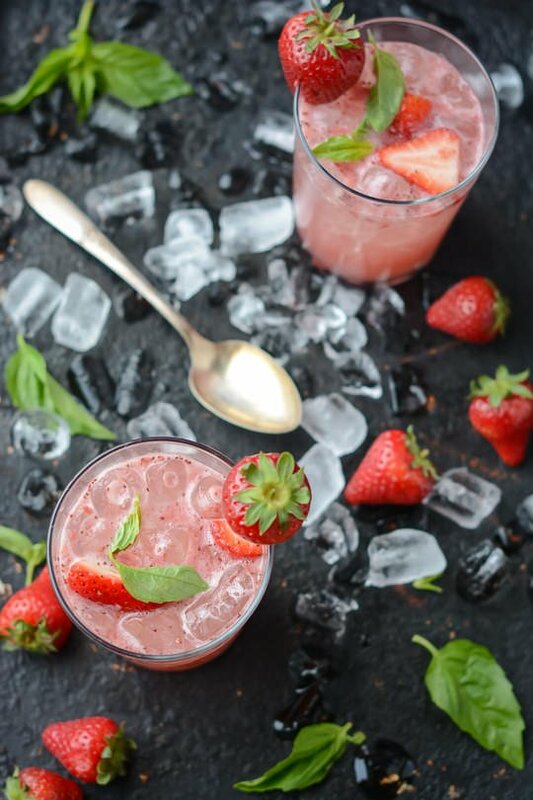 To serve, spoon 2 tablespoons of the strawberry syrup into an 8-ounce glass, top with club soda, and stir. Taste and add more syrup if desired. 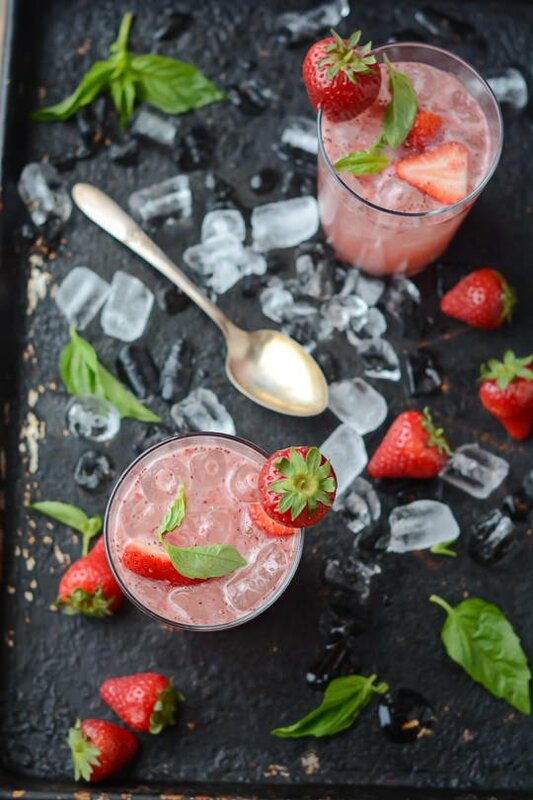 Garnish with sliced strawberries and basil leaves if desired. Syrup can be refrigerated for up to a week. Thanks for the encouragement. Most of the time he’s a great kid, we are just going through that hormonal ultra sensitive phase. I keep telling myself it can’t last forever! Can the syrup be canned or frozen? You can definitely freeze the syrup in a plastic container. I haven’t tried canning the syrup and I’m not sure if there is enough acid from the vinegar to make it safe for canning. To be sure I’d add a tablespoon of fresh lemon juice to the mixture if you want to can the syrup. I hope you like it if you give it a try!